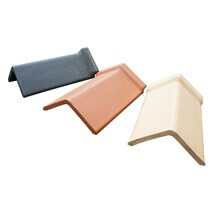 The Capped Ridge Tiles are available in Red, Buff and Blue/Black. R= Red, B = Buff, X = Blue/Black. When ordering, please add the colour code to the product code: For example, YR53 in Buff = YR53B. A large selection of our products are available IMMEDIATELY for delivery within 3-4 DAYS! The product images, specification sheets and drawings shown in this website are the property of W T Knowles & Sons Limited. Any unauthorised use of these images is prohibited without the written permission of W T Knowles & Sons Limited and will constitute an infringement of copyright.